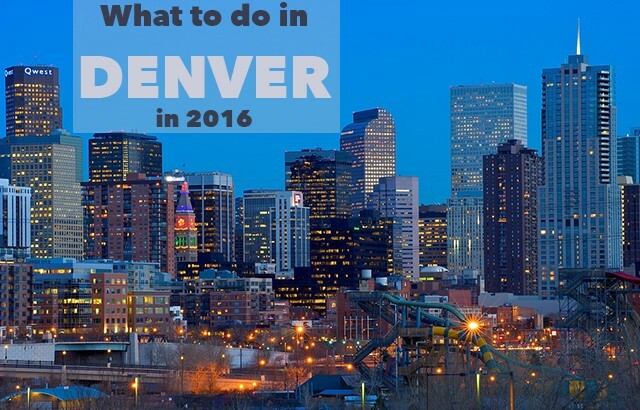 No matter what time of year it is, there’s always something interesting to do in Denver! If you decide to study English at BridgeEnglish Denver you won’t want to miss out on everything the city has to offer. Here are the highlights of 2016, because it’s never too early to mark your calendar for the best events. Start the new year off with gusto by joining the 8th annual Evergreen Lake Plunge on January 1st. The brave plungers will leap into the icy-cold Rocky Mountain waters of Lake Evergreen, via a hole carved in the ice. The event starts at 10:00 AM and runs until 2:00 PM, with the plunge at noon. Attend the only winter concert at Red Rocks! No visit to Denver is complete without catching a show at the iconic Red Rocks Amphitheater. On January 29th you can attend the venue’s only winter concert; Icelantic’s Winter on the Rocks annual event features headliners Adventure Club and Big Grams. Join in the energy and spirit of Denver basketball fans by attending a Denver Nuggets game at the Pepsi Center. The Nuggets take on the Toronto Raptors on Monday, Feb. 1st at 7:00 PM. February 26th is the start of the 12th annual Restaurant Week in Denver (which is actually 10 days). During this favorite foodie event, the best eateries throughout the city offer special fixed price menus, giving you a chance to try new places and new plates. The St. Patrick’s Day Parade is Denver’s biggest! Leave it to Denver to put a Western spin on an Irish holiday with the 2016 theme being “The Irish Stampede.” It will feature horses, stagecoaches, marching bands, floats with a decidedly Old West feel. You can attend First Friday in the Santa Fe Art District any month of the year, but why not wait until spring temperatures thaw things out a bit? From 6 to 9 PM the first Friday of every month you can stroll the streets of Denver’s colorful Santa Fe neighborhood, weaving your way in and out of the many art galleries. Free, guided shuttles can pick you up at the light rail station at 10th Avenue and Osage Street and transport you around the Art District between 5:30 and 9:30 pm. This is the start of Major League Baseball season, so head to the heart of downtown Denver and be a part of one of the first Colorado Rockies games at iconic Coors Field. It’s impossible not to catch the spirit of the fans, as you munch hot dogs in the stands or enjoy a cold drink at the Rooftop Bar as you cheer on the team. The Rockies home opener is April 8th, when they play the Padres. The spring thaw is going to make you want to get outside, so dust off your sneakers and sign up for the Cherry Creek Sneak. You can choose from a 10-mile, 5-mile, 5k or 1.5-mile sprint course, all originating in Cherry Creek. The fun event takes place on Sunday, April 26th. The Cinco de Mayo celebration of Mexican culture is one of the biggest in the U.S.! 2016 marks the 29th year of this annual event in Denver. It kicks off with a parade and draws a crowd to Civic Center Park, where hundreds of booths offer Latin food and art, with a backdrop of live music and dance. During Memorial Day Weekend, you can attend the 3-day Downtown Denver Arts Festival, where over 130 artists display works in mixed media, clay, fiber, photography, furniture, glass, jewelry, wood, and more! The event takes place at 16th Street and Glenarm Place. Denver Film Society Presents: Film on the Rocks at Red Rocks. The series of films begins in June and runs through mid-August on Tuesday nights. Doors open at 6:30 PM, a live band plays at around 7:00 and the movies start between 8:30 and 9:00. The PrideFest event draws a giant, fun and festive crowd every year. The June 18 -19 event starts with a morning parade that winds its way from beautiful Cheesman Park all the way to Civic Center Park downtown. There you can enjoy food, live bands, DJs, and vendors in support of Denver’s gay and lesbian community. The city of Aurora, on the Eastern edge of Denver, hosts the Independence Day fireworks display. There’s free parking and you can enjoy live bands and buy food and drink as you watch fireworks from the lawn of the Aurora Municipal Center. At Summer Brew Fest, July 22nd and 23rd, the Mile High Station on Colfax Avenue (near downtown) hosts over 45 state and local breweries, offering a variety of Colorado-crafted beers. Listen to live local music and grab some food from the various vendors and food trucks as you sample the beers. Finish off your sunny Denver summer by attending the Colorado State Fair, August 26- September 5 in nearby Pueblo. At the fair you can see concerts, watch a rodeo, ride the many carnival rides, catch the parade, or browse art and animal exhibits. Celebrate Labor Day Weekend by attending A Taste of Colorado, where over 50 of Colorado’s most delicious restaurants offer sample-sized portions of their favorite dishes. As a backdrop to your tasting experience, outdoor stages feature live bands, and you’ll also find carnival rides, games, and plenty of arts and crafts vendors. Tour de Fat is New Belgium Brewing’s traveling celebration to raise awareness about the benefits of bicycling, both for our own health and the planet’s. At the September festival (exact 2016 dates to be announced), they even hold a “Car for Bike Trade,” in which car-driving commuters officially give up their car keys and commit to a bike as their main means of transport. Prepare for the zombie apocalypse as Denver is taken over by the annual Zombie Crawl. Register to join the crowds of painted and costumed undead shuffling through the streets of downtown, starting at Skyline Park (at 16th St. And Arapahoe). It’s the perfect pre-Halloween event! Starting in November and continuing until January, the Denver Botanical Gardens lights up the night with the magical Blossoms of Light event. Tour the illuminated gardens with a warm drink in-hand to get yourself in the holiday mood. Join around 10,000 people on Thanksgiving morning for the Mile High United Way Turkey Trot! Scenic Washington Park hosts this popular 4-mile run/walk, where you can burn some holiday calories while helping raise funds for United Way programs. Downtown Denver helps you officially kick off the holiday season with the annual 9News Parade of Lights the first week of December. Crisp air does nothing to dampen the enthusiasm of the thousands who attend this colorful event to watch marching bands, dancers and light-covered floats meander their way through the streets of downtown. The parade starts at 8 p.m. at the spectacularly lit City & County Building. This is the perfect time of year to lace up your skates and hit the ice at one of two unique skating venues in the Denver area. City dwellers can skate for free (or rent skates for $2) at the very urban Skyline Park, located conveniently in the center of downtown Denver at 16th and Arapahoe Street. If a mountain lodge in the woods is more your scene, then head to Evergreen Lake House, just 20 minutes outside of Denver. It opens mid-December for skating. These are just some of the fun and diverse local activities the Mile High City has to offer. There’s never a dull moment in Denver!